Dachshunds might be seen as a small breed but don't be deceived, this breed possesses magnificent energy, are quite head-strong, are highly intelligent and have unbelievable athleticism. Like most dogs they love nothing more than to play but when it comes to toys they can be quite destructive unless you buy Dachshund-proof toys a.k.a indestructible toys. The best toys for dachshunds are: chew toys, toys you can stuff treats in, puzzle toys, small balls, rope toys and bone dog toys. 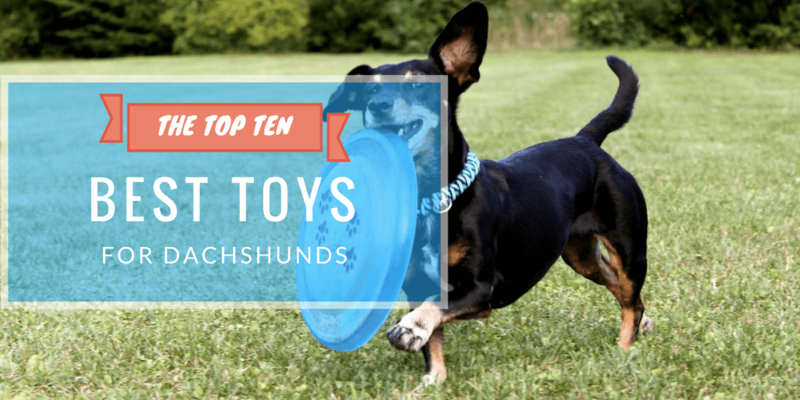 Unless you want to throw your money away on useless toys that end up being torn apart and making it to the “toy graveyard” then read our recommended top 10 best toys for Doxies (revised for 2019) that are tough, safe and guaranteed to keep your pup engaged for hours on end! 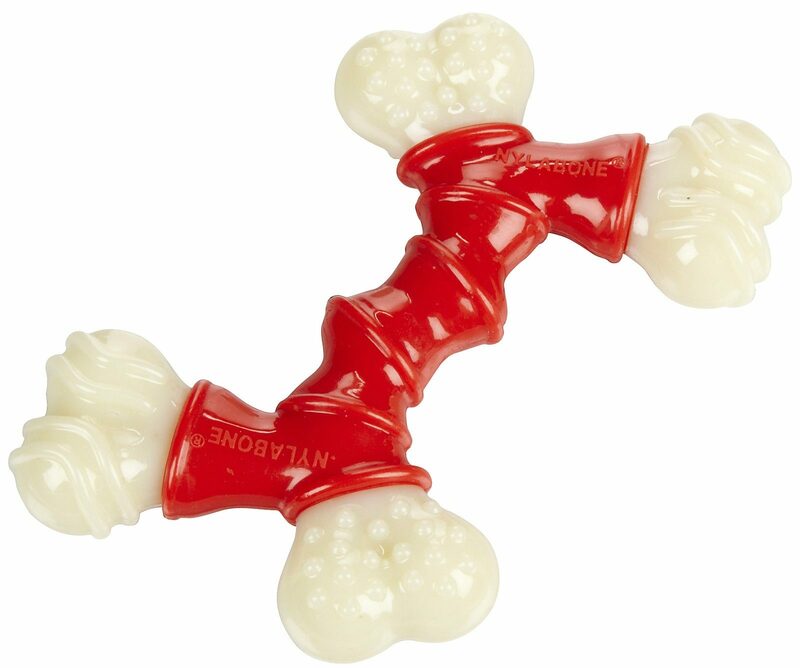 This is a great dog bone toy that is ideal for physically and mentally stimulating your dachshund. Chewing on the Hurley dog bone will keep your pup busy for many hours and prevent it from being over-mischievous. This Hurley chew toy is tough if your dachshund has strong jaws and a passion for chewing. Plus it goes without saying, it will help towards maintaining health jaws and strong teeth. This is a great toy to encourage your dachshund puppy or adult dog to use their noses and to challenge them. This puzzle toy will allow your pets to learn how flip and slide compartments order to retrieve the hidden treats. Nina Ottoson’s dog toys are a great toy in your arsenal and helps fight boredom, engages and entertains your dog. 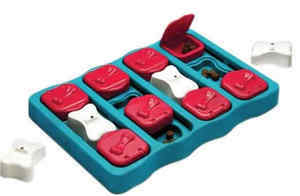 This is a Level 2 game, it has 3 different treat feeding features and is equipped with separate, removable bone shaped puzzle pieces. This allows pet parents to change the difficulty level by using the white plastic blocks placed over the treats or just sliding the brown discs. An overall great interactive toy for dachshunds, during hot weather (hide frozen treats) or just for keeping them mentally stimulated while enjoying themselves. It comes with a 30-day limited warranty. This is a great squeaky toy for your wiener dog. 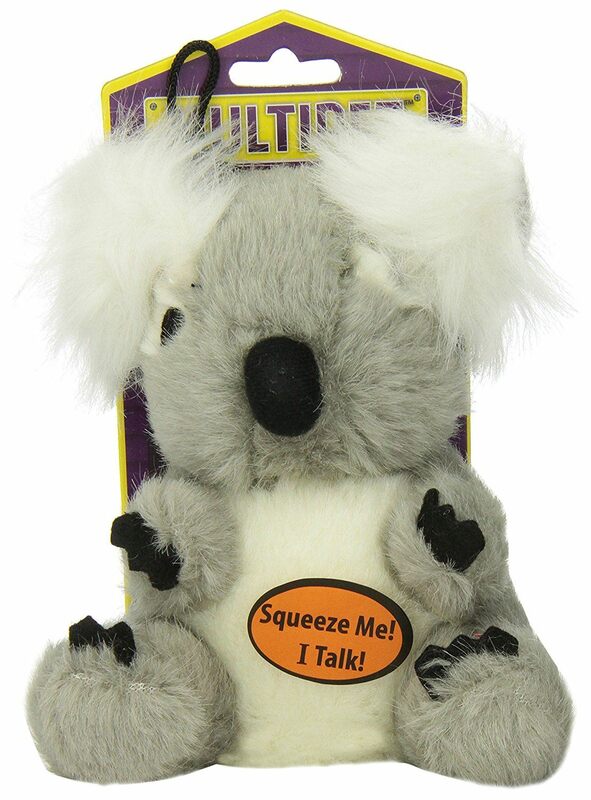 It is 7’’ tall and imitates a real-life laughing koala and makes noises every time your pup squeezes its belly. The laughing noise is intriguing to a dachshund and thus makes for a great mind stimulating toy. This is a safe toy as no toxic plastic has been used which gives peace of mind and is durable which will last quite a long time even under the most strenuous paws. Another great toy for a Doxie of any age. This squeaky toy is free from stuffing with comes with two different sounds. It’s also lightweight making it easy to carry and toss around. Your basket of toys wouldn’t be complete without a tug rope toy for your dachshund. If you want a toy that your dachshund can't chew through, this sturdy toy is ideal and especially suited for this small breed. Great for tug of war with your pal! Overall, we highly recommend this extra-durable chew toy if you're looking for long-lasting for hours of endless fun for your Doxie. Great for tug of war with your pal! If you own an extremely intelligent Dachshund that gets easily bored with his toys, this interactive toy is guaranteed to keep him stimulated with dog hours of fun. 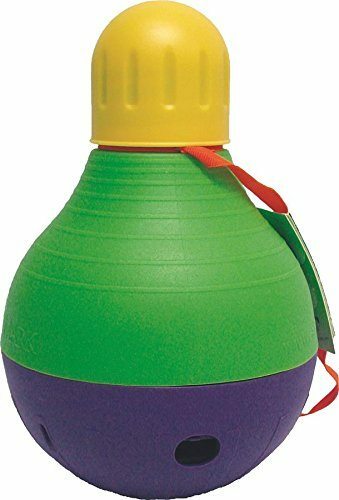 This toy wobbles, the yellow part comes off so you can put in your pup’s favorite treats inside or even his full meal so mealtime can take longer. You can set this toy at different levels with the movable flap inside, so if your dog is super intelligent you can set it for the more difficult level. 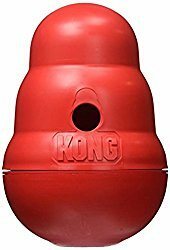 It is similar to Kong’s wobbler but allows you to set up different levels which is why this toy is so great. Another top rated product for aggressive chewers and comes with stellar reviews from Amazon. It will guarantee hours long of pure doggy-fun entertainment for your dachshund and withstands even the strongest jaws. Long lasting toy, a must have for your arsenal! Like so many other dogs, Doxies love balls. But this is also another great treat dispensing toy. You can place kibble inside the ball and as your pup moves the toy around, the treats fall out. Long after the treats are gone, your dog will continue to play with it for many hours. 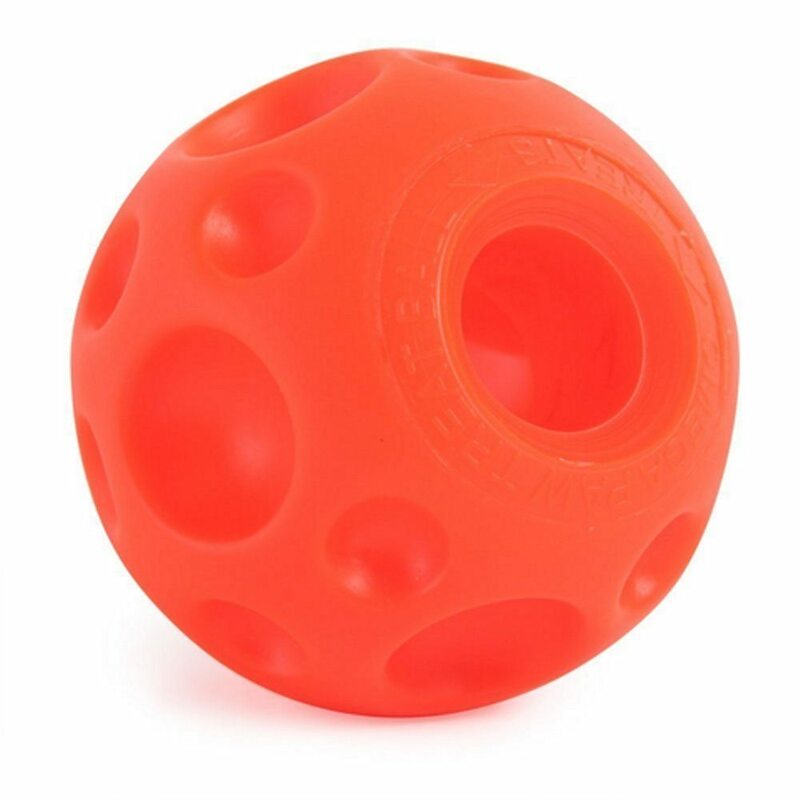 A great challenging interactive ball with a unique shape and soft texture that makes it easy for your Doxies to grip. 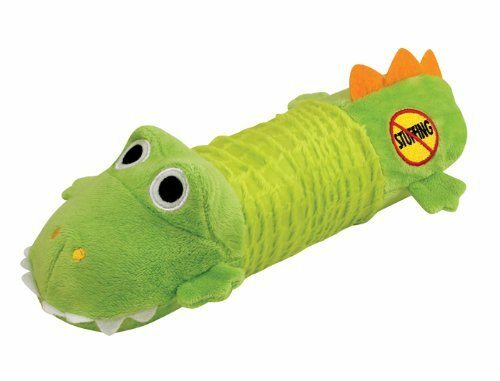 We couldn’t complete this top rated dog toy list without including the perfect plush sleeping toy for your dachshund puppy or adult dog. 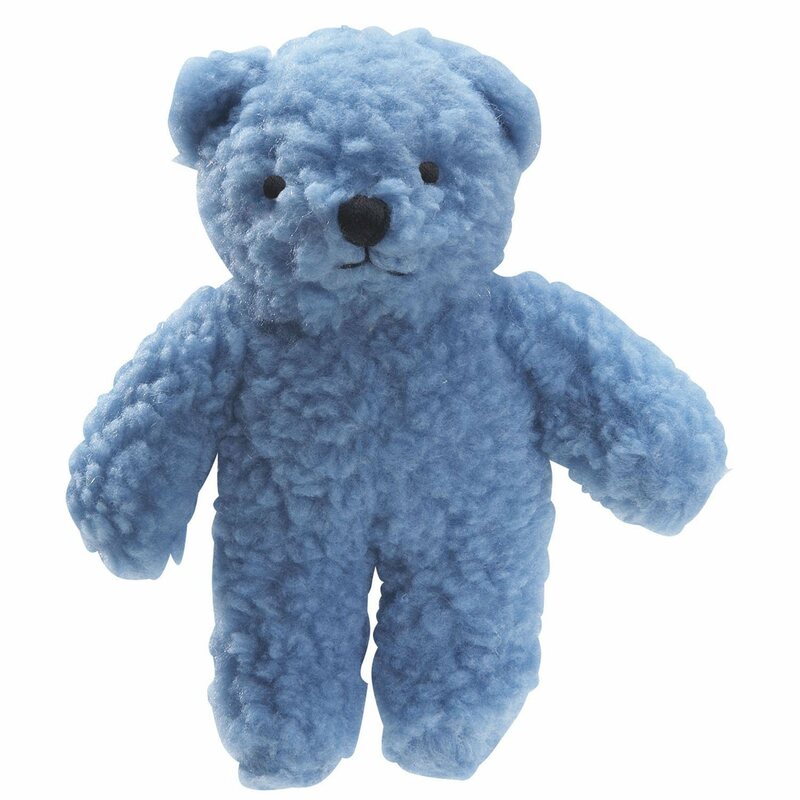 Your pup will love the softness of this teddy bear and Zanies are known for making durable tough plush toys and this little gem is no different. This tough toy will be around for many years to come. Which Toys Should You Avoid? The dachshund is not a great fetch dog and buying toys for playing fetching like a Frisbee or Flying Disk may be a waste of money. The dachshund truly loves squeaky toys but they may bring other trouble to your house. This is because the dachshund is a natural explorer (or demolisher hehe) and will want to know what’s inside the toy and will have it torn apart in hours unless it’s a good quality squeaky toy. Not only will this cause a lot of mess, but they may also be toxic to your pup. Not all toys are equal, so due diligence and caution is required when you shop for toys. How Do Dachshunds Like to Play? Being a small dog, the Dachshunds enjoy endless hours of play – what pup doesn’t? But, this breed is no couch dog. It is recommended a dog has ample time and space for playtime in order to live a healthy and long life. If you find your dachshund chewing vigorously on toys, furniture etc., this may be a sign that they may need more exercise. Lack of sufficient play and exercise will also lead to a lot of weight-related health problems for the Dachshunds which only increases their risk of IVDD given their distinct body type making them particularly susceptible to back and spine problems. There is a one in four chance your badger dog is going to need spinal surgery and this can be very expensive to treat. Bottom line, smaller dogs are more susceptible with being overfed, leading to obesity and host of other problems (and unavoidable pet insurance coverage) and as a result - Doxies need lot of play and careful exercise. Although the Dachshund is known for its ability to dash after smaller animals or anything that moves, it is not a perfect fetching dog. But it can be a great companion if you love jogging or taking strolls around your neighborhood. The Dachshund is also great at playing hide and seek. Hide and seek games provokes the badger hunting instincts and thus makes this breed a natural at this game. This is a game that taps into the natural instinct of the dachshund as a hunter. Here your dog has to navigate a manmade tunnel in an effort to hunt down some rodents. If you live in a neighborhood with many rodents then you will want to train your dog on this so that it can help eliminate such rodents as rats that may cause destruction to your home. This is one of the most popular games for the Dachshund. Most dachshunds love playing with toys and this game presents a great opportunity for such activities. With this game, you take any toy be it a small ball or a small sturdy chew toy and you toss it across your backyard or even a room and the dog will run and get it for you. This makes your Dachshund run around, use its their minds and muscles and thus burn the excess energy and tire out physically. Hide their toys in various spots around your house and let your dachshund find it. Your pup will love this! Another great idea is to hide their breakfast in a treat ball and have them push it around to get their breakfast out. Similarly you can use this method when you have to leave your dachshund home alone, simply hide treats and they won’t even notice when you're gone and stops them from being anxious too. There isn't a game that a wiener dog doesn't like to play. I've scoured the internet and found this video of a Doxie named Peanut playing a doggy game on an IPAD. It's super cute, enjoy! Have a good mix of toys from interactive, plush toys, puzzle toys to kongs and these will ensure your pup remains entertained for hours when you are not around. Finally it is recommended that you rotate your dog’s toys around and bring out a few at time so your dachshund never gets bored or tired with them. All dogs love new toys, so this will keep the novelty of newness for longer.